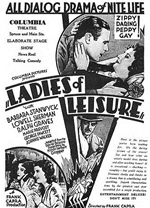 Ladies of Leisure is a 1930 American pre-Code romantic drama film directed by Frank Capra and starring Barbara Stanwyck and Ralph Graves. The film is based on the 1924 play Ladies of the Evening by Milton Herbert Gropper,[Note 1] and has a screenplay by Jo Swerling. The film is about an artist from a wealthy family who hires a "party girl" as his model. As they get to know each other, the girl begins to regret her past, and the two fall in love, but they must face his family's strong opposition to their union. Ladies of Leisure received generally positive reviews, and Stanwyck's performance was praised by critics. The success of the film made Stanwyck a star.